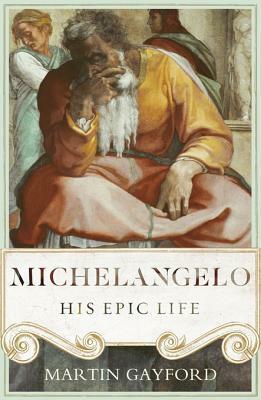 Michelangelo: An Epic Life by Martin Gayford is an insightful and objective portrait of one of the greatest artists. We are taken into the heart of 15-16th century Florence, the backdrop to one of the biggest cultural revolutions and to the genius of a man who was one of those who made Renaissance what it was. Written more like a story, we are given an in-depth look into Michelangelo’s insecurities and triumphs; his jealousies and fears, as he was living and working in a time marked by wars and political turbulence one one hand, and vision and creativity on the other. I was absolutely shocked at the amount of 5-star reviews this book received everywhere. I gave up after a short while as the book is just painful to read/make sense of. The author jumps around in a bizarre erratic fashion, not only from fact to fact, but from various ages in the artist's life. One moment he's describing something from the teenage years, the next he goes off on a completely random tangent into something not even remotely related, and jumps ahead into the artist's later years. Writing a biography should have at least some structure, surely. This has none at all. I even skipped ahead into other chapters and found the same random bouncing there too. It's as if there's too much information, and the author can't decide how to go about organising it, so he just throws information into the chapters randomly. Consequently it makes no sense at all, it's the weirdest attempt at a biography I've ever seen. I'm not sure where the editor was before this book went to publication, but if I was their boss, I'd be sending out a "sorry but we have to let you go" letter. Very disappointing. A very well written biography of one of the most complex and free-spirited artists ever to have lived. Michelangelo's long life allows us to look closely into the Renaissance, its cultural, political and religious aspects all intertwined. This is Florence, Rome; this is the time of the nepotistic and corrupt papacies, the aristocrats turned patrons of the arts; the struggle for power over Europe between the royal houses and the Vatican; this is, specially, a time that called for reform within the shamefully perverted and corrupt Roman Catholic church. A time for change that would split Europe, north and south, spiritually. There were so many rivalries, national and familial, that it was a dangerous time to live in, and your life depended on whose side you had taken at every turn of events. Michelangelo's life is so interesting because he happened to be an oddity for his time. He managed to save a remnant of independence in his life and his work in a time when independence, financial or spiritual, was not possible unless tolerated by the spiritual powers of the dominant church or by the temporal powers of the aristocrats. And if Michelangelo managed it was through the marvelous quality of his work. Dukes and popes admired and tolerated him in the interest of having his art as their possessions. The author does a good job revealing all the details that are known of his life, but never making conclusions from them, because -and that is the key to the man- even added up through a long life they never are concluding evidence to reveal who Michelangelo really was. That is the weird thing: we know what he worked on, what he did, who his friends were, what made him angry and what made him happy, but we still cannot come to conclusions as to add a single adjective next to his name. His sexual life -or lack of it, is a clear example of how hard it is to judge the man. There seem to be hints enough to think he was homosexual, but never anything conclusive, he even was a pious man, someone who towards the end of his life would have fitted better within the camp of the Lutheran reformers than with the Catholic sellers of indulgencies and worshipers of relics. His sexual or asexual life is open to everyone's own conclusions, and the author does very well in leaving those conclusions, as it is proper in this case, to the reader.His life is full of ambiguities. Was he a greedy man, a miser man? He did earn a lot of money, and by the standards of his time, was quite a rich man, and he saved it up mostly. He was keenly interested in being paid and being paid well, and recognized. But we cannot say conclusively that we was greedy or a miser because he did give away much too, to those he loved most dearly. He was a grumpy old fellow, he didn't keep his friends for long, always breaking up good and lasting relations, but we cannot assume that in all those cases he was not justified in doing so. If one adjective seems to come closer to describe the man I guess it could be ambiguous, which is not properly a description of him but an acknowledgment of how little we understand about him. My impression is that, aside from his public life, which is absolutely interesting and truly epic, the man Michelangelo was an artist who fought all his life for his artistic independence. He worked hard, even obsessively on his art, whether it was painting, sculpture or architecture, knowing well that only achieving perfection could he earn some degree or independence and be able to choose his next master, rather than being himself chosen and told what to do. Individualism was, I believe, his credo. He did something no artist had done before, in the words of the author: “He transformed the notion of what an artist could be.” That's what puts him above other great artists like Raphael or Titian. Being requested by the powerful oligarchy and well paid was not an end in itself, it was a means towards another end, the acknowledgment of his own dignity as an individual, the dignity of man who values freedom first.And if he was a strange person, or a hard to understand person, it was because he was struggling hard to be that free man in a world where only the powerful could be so. Michelangelo had in his mind and through his hands the tools that could earn him his freedom. Well thought, it is indeed weird: he became free without having power; within that freedom he was equal to his powerful masters the popes and the dukes. Maybe he wasn't so strange; maybe the strange were everybody else. I bought and read this on my Kindle and it was immediately obvious I should have got a paper copy instead. Not so much for the pictures and photos, which are in effect best viewed in the near to perfect HD electronic format than on paper, but because the last 25% of the book (which is overall 800 or so pages long!) is taken by lists and lists of Bibliography, exhibition catalogues, and numerous Notes and References, all referred to in form of clickable links throughout the other 75% of the book, at the frequency of 2 or 3 links per paragraph at the beginning, thus making it frustratingly impossible to turn the pages or touch the screen without jumping to the end of the book and from there finding it hard to get back to the page I was actually on and interrupting the flow CONTINUOUSLY, ruining the experience.The biography was somewhat confusing to begin with, for example it strangely starts from the end ... really ... it begins more or less with the account of Michelangelo's death and the aftermath of his death, including the smuggling of his body from Rome to Florence after his (first) funeral and the mystery surrounding the fact that when, a good few weeks after he had died, it was decided to open his coffin to satisfy all present that Michelangelo was really back in Florence where he belonged, to great surprise of all, the artist's corpse was not in the least spoiled or decomposed but wholly intact and perfectly preserved, as if he was simply asleep. Miracle? Well I suppose it is all just very apt for someone who was called and considered by most "Divine" during his, at least for that time, astonishingly long life.Apart from strangely starting from his death rather than his birth -- no spoiler there after all, we all know Michelangelo eventually died (or not?) -- Gayford seems to, rather annoyingly, jump back and forth in time during the first chapters, making it a little confusing to get a coherent picture and chronological account of the historical events and the frame of mind of the artist during the creation of his most stunning works of art. On top of that, during the first third or so of the book, I couldn't help noticing that most of all accounts of his earlier life were effectively taken from extracts from the two biographies written while the great man was still alive ... biographies which are often conflicting and which were even amended (or indeed embellished!) by Michelangelo himself. It's all very well to mention and to use the two previously written, and approved by the artist himself, biographies, however I felt I should perhaps be reading straight from the original Vasari or Condivi works since most of these pages seemed to be coming from there.Later on the book slowly takes a life of its own, the pace becomes in my opinion less erratic and the account of the artist's life (which is most strangely very long while all around him 7 popes, rivals, lovers, servants, foes, friends and close or distant family members were dropping dead one after the other, at a comparatively young age, due to plagues, persecutions, murderers, incurable illnesses and so forth) becomes more linear and more the author's own words.In particular I very much enjoyed learning about the rivalry and love/hate relationship between the young Michelangelo and Leonardo Da Vinci, whom I started to see in a very different light to what I had grown to know, all quite amusing in fact in their attempts to copy/outdo each other: I was left with the feeling that both these geniuses were after all also half human. Michelangelo's epic life is well worth reading. He was most certainly an incredible man, surrounded by mystery and full of contradictions, with an irascible temperament and yet most sensitive soul, and with an incredible imagination and richness of thought. He seemed to be proud, arrogant and irascible one minute and unreasonably modest, generous and pious the very next. Conflicted about his sexuality and - to me endearingly - very much antisocial, yet fiercely attached and loyal to his young beautiful friends and platonic loves, lovers and even servants of his life. He very inexplicably escaped death quite a few times, managing to flee at the right time, avoiding various assassination plots and also surviving deadly diseases and strong fevers, and making lots of enemies along the way. He was very wealthy and yet lived most of his life humbly, almost in squalor. Never afraid to voice his opinion, his 'terribility' was felt by all who came close to him, including the several popes he worked for, his rivals and his helpers and apprentices (I could just picture him, 80 years old in his workshop, losing his temper and taking a mallet to his last Pieta' and smash it to pieces, to his helper's consternation, in his frustration when the huge block of marble suddenly revealed a crack). Understandably, like most highly gifted people, Michelangelo had far too many projects on the go at the same time, starting an overambitious project only to take another even more ambitious one half way through, and then another, losing interest a little over the grandeur of one, to start planning the next even more grand work of art, effectively lacking the time to complete all, and so it is no surprise that so many of his major works rest sadly unfinished.What is astonishing is that for someone who claimed that painting was not 'his profession' and so looked sometimes scornfully upon this form of art, Michelangelo left us with what must be the most breathtaking frescoes known to man (far superior in my very modest opinion to Leonardo's or another one of his rivals, Raphael's, both of whom believed painting was a more divine form of art than sculpting), never repeating the same expression or pose in the hundreds nudes he painted.Later in life he even took the sometimes controversial role of architect, even though he would still claim that it also wasn't 'his profession', creating some astonishingly innovative plans for buildings such as San Lorenzo with the Medici Chapels and the Laurentian Library in Florence, and St Peter's in the Vatican itself amongst others.He was also an accomplished poet, with his numerous, at times very humourous, at other times moving or simply stunning, sonnets.And yet he always claimed that 'his profession' was liberating those divine angels from huge blocks of marble (which he would personally jealously supervise excavation and transportation of), chisel in hand, hacking away until his very last days, even when quite old and frail. Overall I felt it was a worthwhile read and Gayford portrayed quite well how Michelangelo thought of himself and his time, and how he lived and I would recommend this to anyone who, like me, has recently been to Florence and felt the amazingly strong, still very much alive, impression Michelangelo left all around the city, or quite simply has ever admired any of his incomparable works of art, or even more strongly to those who know nothing of this great artist (mmmm ... does that leave anyone out? ).My favourite passage from the book: "Michelangelo believed that he had a temperamental affinity for the dark, ‘il tempo bruno’. Night was the time of shadows, melancholy and thoughts of death – but also of soothing oblivion and dreams. ‘ Oh night, O sweetest time , though black of hue,’ he wrote in sonnet no. 102, ‘you cut the thread of tired thoughts, for so/ You offer calm in your tired shade.’ In sonnet no. 104 he described how ‘he who created time from nothingness’ gave one half to the sun, the other to the moon: ‘I was assigned the dark time for my own,/ As what my birth and cradle suited best.’ This was an intriguing and – for the time – startling series of reflections. The year of the poems is unknown, but they seem to date from later than the period of the Medici Chapel, in which the most imaginatively extraordinary figure was that of Night. It was literally true, as recorded by his father, that Michelangelo was a child born in the night: ‘at the 4th or 5th hour before daybreak’; this is around 1.30 to 2.30 a.m. But also at a deep level he came to identify himself with the hours of darkness, and secrecy." Enjoyed this book immensely. One can only come away with sympathy for a fellow artist who time and again imagined grand designs and was thwarted by a mixture of politics and his own limits. The mind boggles at the lengths he would go to realize his vision and yet notice how few of his works he managed to fully complete. This biography offers a glimpse into the mind and world that made the epic work of Michelangelo possible and impossible. The drawings, paintings, buildings, sculptures and fragments we are still able to see in our century seem all the more worthy of praise in light of the efforts he took to bring them into being. Martin Gayford - Martin Gayford is an art critic and art historian. He studied philosophy at the University of Cambridge, and art history at the Courtauld Institute of Art at the University of London. Over three decades, he has written prolifically about art and music in a series of major biographies, as well as contributing regularly to newspapers, magazines and exhibition catalogues. In parallel with his career as an art historian, he was art critic of The Spectator magazine and The Sunday Telegraph newspaper before becoming Chief Art Critic for the international television network, Bloomberg News. He has been a regular contributor to the British journal of art criticism, Modern Painters. His books include a study of Van Gogh and Gauguin in Arles, The Yellow House: Van Gogh, Gauguin, and Nine Turbulent Weeks in Arles (Little Brown, 2006), which was published in Britain and the USA to critical acclaim, and has been translated, to date, into five languages; Constable in Love: Love, Landscape, Money and the Making of a Great Painter (Penguin, 2009), a study of John Constable’s romance with Maria Bicknell and their lives between 1809 and 1816; and A Bigger Message: Conversations with David Hockney (Thames and Hudson, 2011).